Recently, an antiques and ephemera collector contacted Friends of the Fountain and Walk with an intriguing pair of photographs he’d found among others in an old photo album he’d purchased. 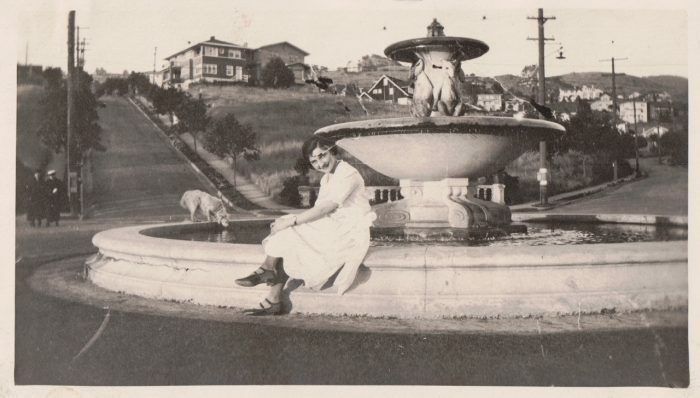 The photos pictured a young woman in early 20th century clothing posed near a pair of fountains. One of them was the Fountain at The Circle. The other was a smaller, less ornate fountain. But the woman appeared to be wearing the same clothes, so likely was photographed the same day, making it likely the other fountain was somewhere nearby. But where? The “most pretentious one” is the one we all know well. “Union Station” was the commuter train stop outside the Solano Tunnel. But the image of the smaller fountain did not appear to show anything in that area. It must have been the one “near the main entrance to the property.” But where was that? But in the background of the photo of the smaller fountain is a distinctive house. If we could locate that — if it was still standing — we could determine where the fountain had been. Luckily, we have several “Friends” who know a lot about our neighborhood, including FOFW board member Holly Rose, who is a local real estate agent. She was able to identify it as 1109 The Alameda, a home just south of the Monterey-Marin merge. It looks a bit different today than in the old photo, but clearly the same house (the online photo has an incorrect address). That means that the smaller fountain had been located somewhere near the intersection of Monterey and The Alameda. On the island where the firehouse now stands? Across the street on the southwest corner? It’s not quite clear yet. If you have any clue as to its precise location, please let us know. And if you have any images of the “Union Station” fountain, please send that along to our email: contact@fountainandwalk.org. Thanks for the fascinating information. Good for you all. Thanks for your note, Audrey. We’ll update with more info if and when we get it. Hello, Ellice, and thanks for weighing in. 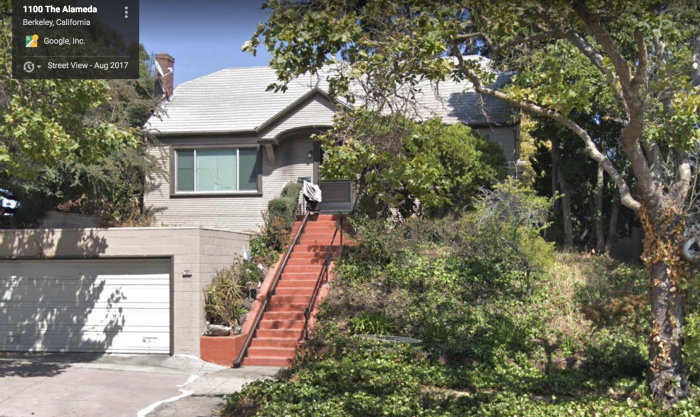 If you read our post, we are pretty certain that the house in the photo is at 1109 The Alameda (the pictures show that, we think). The main mystery is exactly where near the corner of Monterey and The Alameda the fontina stood all those years ago. If you are out investigating, take a look around there and see if you can figure it out. Thanks! I vaguely remember what might’ve been a fountain in the area where colusa and Monterey come together but on the other hand I may be a product of my imagination. I totally agree with Ellice. I have sat waiting at the traffic light at the top of Hopkins looking at that same house across Sutter on the east side of the hill. It looks like the house in the first photo of tithe house in question. Perhaps one architect have built two (at least) similar houses right near each other? I now have to remember to really observe that house and get the address, while at that traffic light!. If I find it I will send a current photo of it. Glad you too, recognized it Ellice! Hi, Mary Ann. Thanks for your interest. Please do send along an image. 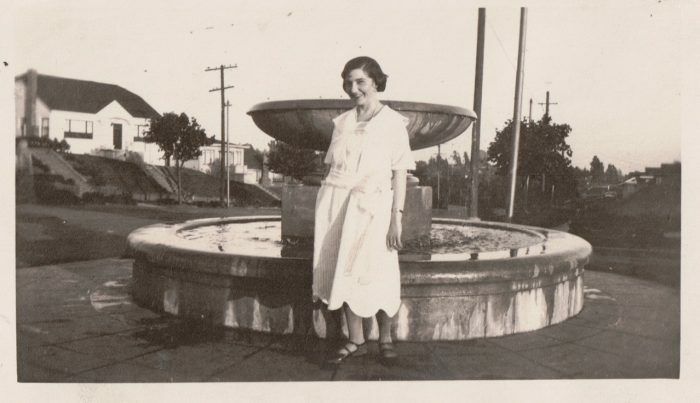 But if you read our latest post on the “lost” fountain — http://www.friendsofthefountainandwalk.org/another-northbrae-fountain-part-3/ — you’ll find an image a neighbor provided that shows the precise location of the fountain we wondered about at the intersection of Monterey and The Alameda. There is reference in accounts from the early days of Northbrae that another fountain was planned for the area near Hopkins and Sutter, so very possibly one was there, too, but have seen no evidence of it yet. Thanks again. Aye, so sorry! I went by today to that intersection at Hopkins and Sutter and I was wrong. Could not find the house I thought was there. Just goes to show me not to trust memory. I also went by Monterey and Colusa and think that grassy area would have made a good fountain base… there is even a circle there in the pavement. Thanks for the work you do with the fountain(s) and history.